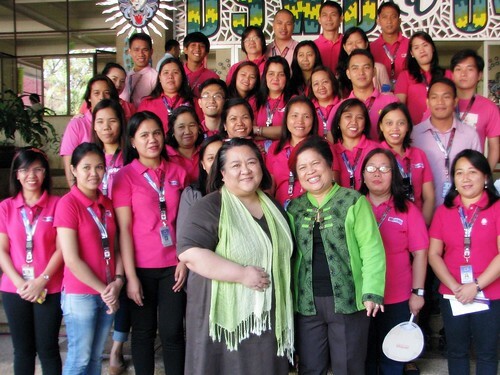 The Autism Society of the Philippines was invited last 02 February 2014 to join the leadership and the social welfare professionals of the Department of Social Welfare and Development (DSWD) Central Office to their Monday assembly to talk about autism. The talk was integrated into the Department's engaging morning assembly. ASP National President Mona Magno-Veluz talked about what our disability community would like to see from government in terms of support, in line with "1Bansa, 1Pangako" initiative. Secretary Dinky Soliman made the 1Pangako pledge and said a few words to commemorate the National Autism Consciousness Week, which coincided with the agency's anniversary. We thank the leaders of the DSWD Protective Services Bureau, Ms. Jesusa Cabilao, Ms. Pacita Sarino and Ms. Camia Ferrer, for helping ASP organize this effort and for being our partners in making the Philippines truly autism-inclusive. About the contributor. Mona Magno-Veluz is the National President of the Autism Society Philippines. Aside from being a practising marketing communications professional in the BPO industry, Mona is a wife and a mom to three kids. Her eldest, Carl, is an adult on the spectrum working with their family business.